I remember the day I took this picture. 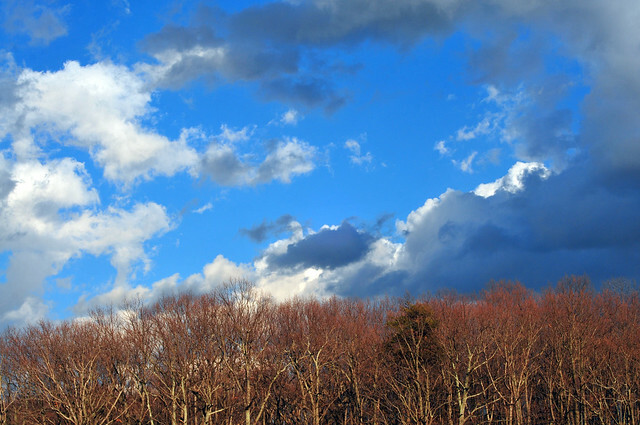 I stood on our second story deck in the cold air and watched that patch of bright blue sky open up over bare winter trees. We only had one short year in Quantico but it was enough time to watch those trees change from one brilliant display to another with each of the four seasons. I don't think I will ever cease to be amazed by the perfect beauty of seasons or by a God loving and creative enough to set them in motion. The same God that numbered stars and formed mountains, laid out my days in a perfect cycle of season. Yet just as I am somehow surprised year after year by autumn colors and spring blossoms, I am continually surprised by His goodness, His timing, His plan. So often I allow myself to believe that the scorching summer heat has come to stay or the darkness of winter has settled permanently over the light, but that will never be true. He has written me into an incredible, unfinished story. Every day turns a new page, and when I stop to gaze into an expanse of breaking blue sky, I am reminded that my story is so much bigger than me. That it's not really about me at all. Actually, I think you put it even better than I do! So, thank you. This is my favorite of your thoughts " I am continually surprised by His goodness, His timing, His plan." I need to remember that in my life right about now. Thank you for sharing. let it snow, let it snow, let it snow...please?